Oscar Schmidt Kunow c. 1935 | HOLD | Many tens of thousands of guitars were sold in the 20s and 30s through 'music conservatories', often a teacher or two with a small studio who signed up local youth for Spanish, Tenor or Hawaiian guitar lessons. Through this arrangement, these tens of thousands of guitars were sold to the enrolled students through a 'pay for lessons for a year, get the guitar "free" scheme'. The Edward C. Kunow Conservatory of Music, at 259 East Elizabeth Ave, Bethlehem, PA, was one such 'conservatory'. 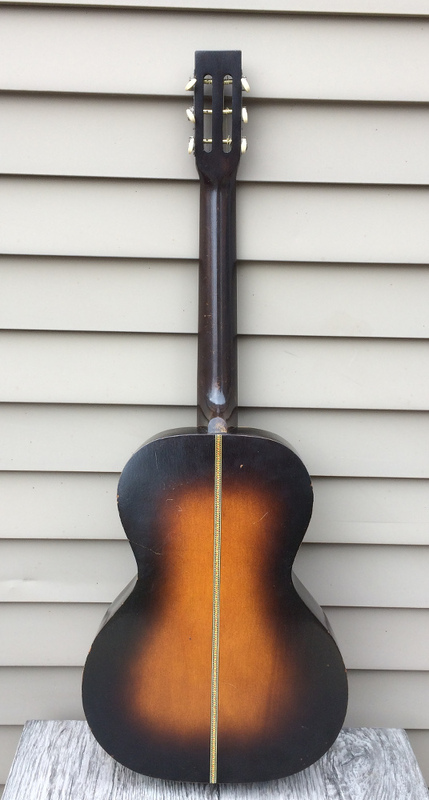 It's apparent that Kunow had an arrangement with the Schmidt company since this example is embossed Kunow on the head stock where you'd typically see Stella. The Kunow exhibits all the hallmarks of a Schmidt-made guitar including ladder bracing (three top braces plus flat bridge plate brace), square kerfing, body shape, position markers and flat-head screws to attach the tuners. 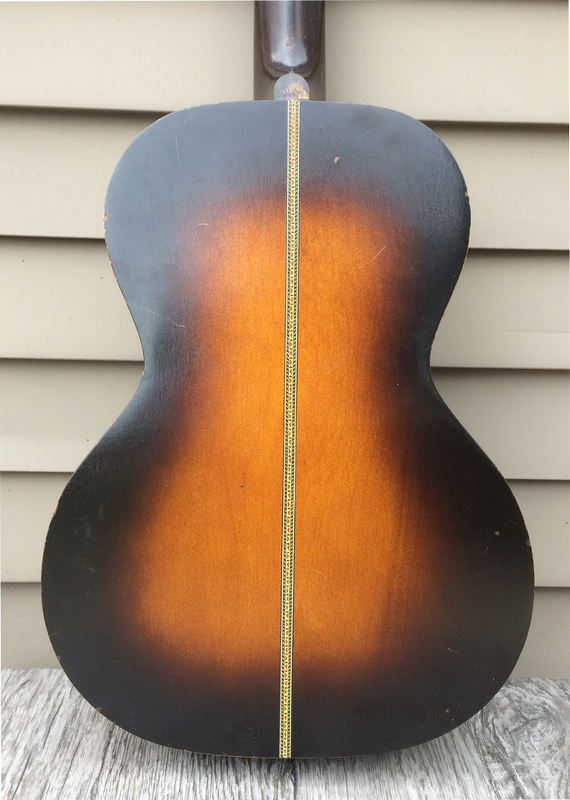 Plus, the beautiful dark sunburst coupled with the attractive checkered purfling was common on many Schmidt guitars. It appears that this instrument was made just before the Schmidt company was sold to John Carner c. 1935. Back and sides are birch, stained a very dark walnut. The top is spruce with a deep sunburst surrounding the painted maple bridge. Sound hole and top are both bound in checked purfling and white celluloid. The back sports a decalcomania strip. The fingerboard is black-painted maple, on a poplar neck. One unusual aspect of this guitar are the numbers and letter 'S' stamped on top of the head stock. This is very unusual for a Schmidt-made guitar, but we have seen it at least one other time. Interestingly the commonly found ink-stamped numbers are present on the top brace, but different numbers. Perhaps the numbering system on the head stock was for Kunow instruments? This guitar is in astonishingly clean and original condition, which adds to its attraction. The finish still sparkles, the original tuners show only the slightest oxidation, and, because the guitar was set up Hawaiian style (and likely a one owner), the frets still had black paint on them! Original bridge pins with pearl dots inlaid. The original nut was replaced with a new ebony nut, and the saddle with new bone. This is a 'concert' size guitar, with the lower bout measuring 13 3/8", and the scale length is 25". The neck is carved into a soft 'V' shape, comfortable to the hand. The neck measures 1 3/4" across at the nut, and string spacing is a hair over 2 1/8" at the saddle. Action is set at 4/64" and 6/64", and the guitar plays easily. 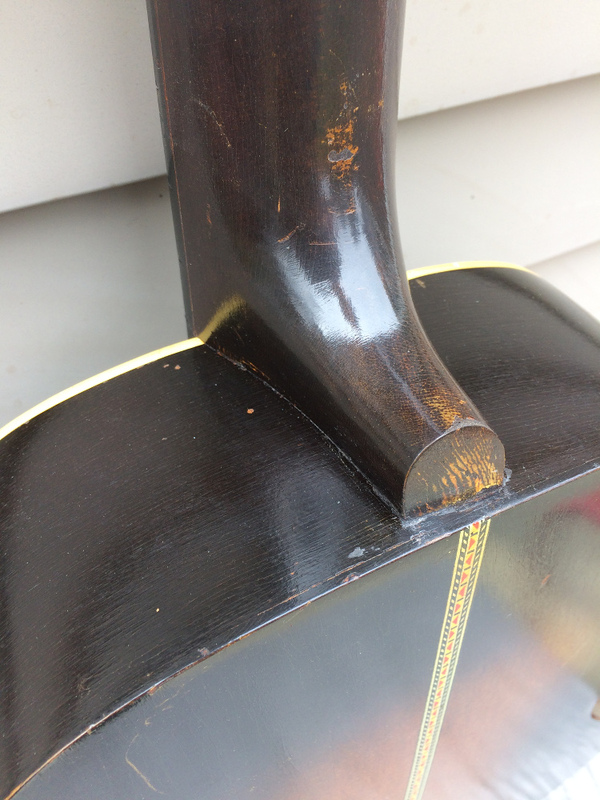 No repairs are evident on the guitar. There is a very slight hairline extending down from the bridge, so tight it can't be glued, and it may not break the bottom surface. There are a few nicks and dings from use. We recently completed a neck reset. As an added bonus, the guitar comes with its likely original soft case in good condition, with purple lining. The sound is the expected boxy, hollow sounding of a ladder-braced Stella. It projects well, and strong in the mids. Great finger picker! Check the sound clip ..